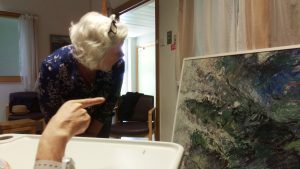 Open Gallery is an art project developed in 2018 by Waterford Healing Arts Trust which invites people living with dementia – and their family members/carers – to look at, discuss and enjoy paintings from the University Hospital Waterford (UHW) Art Collection in a safe and welcoming space, supported by professional artists. In each session, three paintings from the hospital art collection are discussed by the participants. These paintings usually have a theme, for example, landscapes, portraits, colour etc. No experience is necessary. Participants do not have to know anything about art. These sessions are about all the participants making observations, describing, building connections and enjoying art together. Open Gallery has two strands: Strand One is for patients at UHW and takes place every month on the ward (Medical Ward 3 or Medical Ward 5). Strand Two is for people living with dementia in the community and takes place once a month at Waterford Healing Arts Trust Centre for Arts & Health, on the hospital campus. Each session lasts about one hour and finishes with a cup of tea and a lively discussion. Open Gallery is funded by Waterford City and County Council. The project has been adapted to the acute hospital setting at UHW from “Meet Me at MoMA”, an internationally renowned and evaluated programme of dementia-friendly art looking workshops, devised by the Museum of Modern Art, New York, and introduced to Ireland as the “Azure Programme” by the Butler Gallery in Kilkenny, in collaboration with Age and Opportunity, The Alzheimer Society of Ireland and IMMA (Irish Museum of Modern Art). Open Gallery is facilitated by artist Caroline Schofield, who has trained in delivering such dementia-friendly workshops, and supported by artist Jill Bouchier, and Maeve Butler, Acting Assistant Arts Director, WHAT, Amy Power, Assistant Art Curator, WHAT, and Keith Irish, Art Installer, WHAT.